The little man is almost six years old. He will turn six in October. While his contemporaries are already either in kindergarten or grade school, he is not. The husband and I have decided to wait another year before we let our little man go to school. Even if he does not have any school training though he knows a lot of things, mostly by self learning. Some people find it hard to believe that he can already read, write, spell, add and subtract (a little), even knows how to play his little piano. He even knows how to navigate online without any adult help. It is actually where he learned to read (the educational DVDs helped too). We are actually debating on regular school or home school. I know we do not have much time left and we will need to come up with a decision soon. But we will choose what we think is the best choice for our little man. Anyway, I do quiz him from time to time to check about his skills. He does not like doing this because he says he would rather do something else but when I tell him this is in preparation for school he settles down and do what I tell him to do. So, one day we did spelling. I say a word, he writes it down, then show it to me to check. We did several words and I am proud to say we did good in the first half but were arguing about the rest. 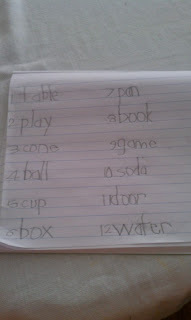 See, instead of waiting for me to come up with a word, he went ahead and wrote words he wanted to write. The husband said to let his son decide so I let him do it. Below is the picture of his work. He wanted everything to be "perfect" so if you notice, every word is neatly written. I must tell you I did not coach him on how to spell the words. It really helps when a child knows how to read and pays attention to what he is reading because he can recall the right spelling of the words. I hope that he will continue to learn and that thirst to learn more will always be in him. My worst fear is that he will regress because he did learn very early. I hope it is not going to happen. If he does go to regular school I hope that he will find a teacher who will nurture his ability to learn. If he will be home schooled I pray for more patience, lol. All the best for you son. He sure a smart fella. That's a pretty good penmanship for a 6 yrs old or not even a 6 yrs old yet. wow! mau pagka train sa inahan da...way to go...hehehe!